Spring is the perfect time to spruce up your outdoor space. For this year’s Patio Style Challenge, Yuni Min of Love Your Abode maximized her patio area by shifting around her current dining set to make room for a comfortable seating set. Check out her styling tips as she adds seating, pops of color, and greenery to liven up her patio for Spring! I can not tell you how excited I am about sharing our spring patio reveal with you. If you’re anything like me, you are probably itching for warmer weather to arrive. Well, at least without all the nasty pollen. We’ve had some crazy fickle weather here in Georgia and I’m looking forward to warmer, drier weather so that we can spend more time outdoors. Thanks to the Home Depot, our patio looks completely different now and our family is looking forward to spending a lot more time out here. This is what we started with. Basically, everything is dead in this picture. Don’t ask me why I kept my dried out mum over there in the corner either. This area gets super neglected during the winter, so that’s my excuse! As you can see, our backyard patio is on the smaller size. 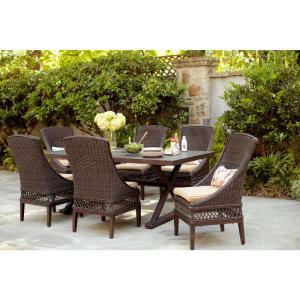 We love our Hampton Bay Woodbury 7-Piece Wicker Outdoor Patio Dining Set from the Home Depot. We bought it two seasons ago. It has stood the test of time and is still available for purchase! Are you ready to see our new and improved spring patio space? HA! I know!! Yes, it’s the same exact space. I can’t believe it either. It’s crazy what some plants can do to a space along with a new beautiful patio set and some styling. I really wanted a conversational set but didn’t think that was realistic due to the small space. We rotated the dining set to one side and there was plenty of room for this sectional. I still can’t believe we were able to fit both sets out here comfortably. 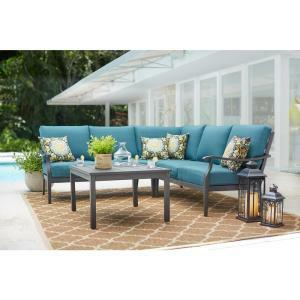 This sectional is from the Hampton Bay Riley Collection and the color of the cushions is Charleston. And yes, I did eat those cookies. That’s the perk of styling, my friends. You get to eat all the things. Because my garden is still dead and everything is dry out here, I made sure to add color with my decor and lots of plants. That just makes everything look alive again. If you don’t pay close attention to the sad condition of my grass, it really does look like spring! I’m most happy when I get to create a tablescape for my favorite people so we can enjoy a meal together. I imagine a lot of get togethers out here with family and friends. 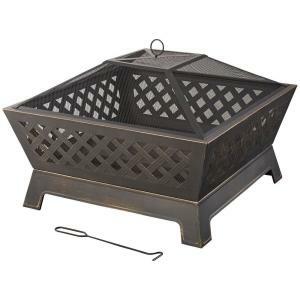 I love that the Riley Collection gives you the option to buy a matching Hampton Bay Tipton Fire Pit. We broke it in the same night I took these photos and our kids had the best time roasting marshmallows and cozying up by the fire. This neutral rug is great because it has a simple pattern and looks way much better than concrete. I love how rugs anchor the furniture and they help divide living spaces especially when it shares one open space. I picked up a bunch of plants from Home Depot because they add so much life to any outdoor space. Every spring, we load the kids to Home Depot and we buy all our garden seeds, flowers and plants. It’s become a fun spring tradition getting our garden back into shape. Plus, these kids need to get to work! I was so happy to find this Hampton Bay 9 ft. Umbrella since our old one was ready to be retired. 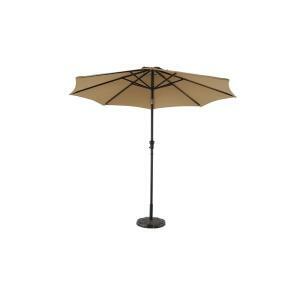 I love that this umbrella has the ability to pivot so you can angle it to block direct sunlight. It also comes in a bunch of different colors. 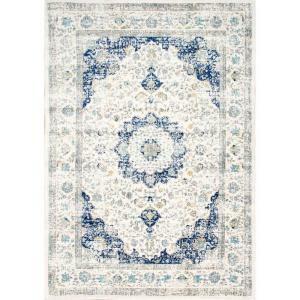 The beautiful Nuloom Verona Blue Area Rug can be found online at the Home Depot. I’ve bought a couple of rugs online and the Home Depot has an amazing selection. I styled it for the photo but do not recommend placing one under a fire pit that is in use. I added a bunch of pillows and a throw blanket to cozy up the spring patio space. This is a simple way to create an inviting atmosphere both indoor and out. We are ready for some outdoor entertaining! Now, if only the weather would cooperate. Our family had the best time roasting marshmallows since the weather was still a bit chilly. Even my little nephew joined in on the fun. I foresee a lot of s’mores in our future and I ain’t mad about it! Thank you so much, Home Depot, for bringing our dead patio back to life. Thank you all for reading and be sure to follow along with me on Instagram where I share lots of decorating tips and crazy day to day shenanigans. Give your patio a makeover for Spring with the help of The Home Depot. Find more Patio Style Challenge ideas on the Home Depot blog.